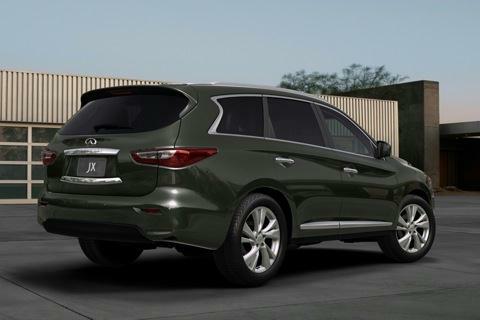 The big news for the 2013 Infiniti lineup is the debut of the JX35 crossover SUV. A 3-row, 7-passenger model, the JX35 is distinguished by the fact that it's the only Infiniti model offered with front-wheel drive and a continuously variable transmission. In other news, the Infiniti EX and FX models swap their standard 3.5-liter V-6 engines for a new, more powerful 3.7-liter V-6, and a new performance-tuned IPL G Convertible debuts for 2013. A moving-object detection system is optional for the FX, JX and QX; the M lineup now offers a Sport package combined with all-wheel drive; and Infiniti significantly chops the number of G models offered this year. Based on the Infiniti G platform, the Infiniti EX is a 5-passenger, 5-door compact crossover SUV. A 325-horsepower, 3.7-liter V-6 engine is standard, paired with a 7-speed automatic transmission and a choice between rear- or all-wheel drive. Standard and Journey trims are available, the latter offered with a Deluxe Touring package including 19-inch aluminum wheels. The Infiniti FX is a 5-passenger crossover SUV equipped with a choice between a 325-horsepower, 3.7-liter V-6 and a 390-horsepower, 5.0-liter V-8 engine. A 7-speed automatic transmission delivers the power to the rear or all four wheels, and this SUV can be equipped with 21-inch lightweight aluminum wheels, a Continuous Damping Control suspension, Rear Active Steer technology, and more. The Infiniti G lineup offers coupe, convertible, and sedan body styles, all equipped with a 3.7-liter V-6 engine and a choice between a 6-speed manual gearbox or a 7-speed automatic transmission. All G models are rear-wheel drive, and all-wheel drive is optional for the coupe and sedan variants (G37x). Infiniti Performance Line (IPL) versions of the coupe and convertible feature a more powerful engine, sport suspension, and appearance modifications. 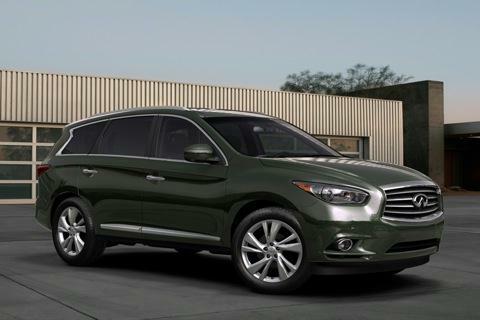 For 2013, Infiniti introduces the new JX35, a 7-passenger crossover SUV sharing its platform and powertrain with the redesigned 2013 Nissan Pathfinder. The JX35 is the only Infiniti model offered with front-wheel drive; all-wheel drive is optional. A multi-mode second-row seat allows passengers to enter the third-row seat without removing a child safety seat. The new 2013 Infiniti JX can be equipped with a long list of optional safety technologies, including lane-departure warning and prevention, smart cruise control with Intelligent Brake Assist and Forward Collision Warning, and more. The Infiniti M is a midsize luxury sport sedan available with a choice between a 330-horsepower 3.7-liter V-6 engine (M37) and a 420-horsepower 5.6-liter V-8 (M56), each available with rear- or all-wheel drive. A hybrid model is also available, producing a combined 360 horsepower from a 3.5-liter V-6, an electric assist motor, and a Lithium-ion battery. Infiniti says the M35h produces V-8 power while supplying the fuel efficiency of a 4-cylinder. The Infiniti QX is a full-size luxury SUV featuring body-on-frame construction and up to 8,500 pounds of towing capacity due to its 400-horsepower, 5.6-liter V-8 engine. This model previously was based on the Nissan Armada, but when the QX was redesigned for 2011 it migrated to a unique platform. Rear- and 4-wheel-drive variants are available, and the QX seats up to 8 passengers in 3 rows of seats.